During the past chaotic week I’ve become of a shift in my seeing the landscape and a greater freedom to sacrifice reality for strong design. I am finally seeing overall patterns of value rather than textural patterns created by smaller shapes. Perhaps reading the books by Claude Croney each night before falling asleep has helped. As I sort through my older work, to make room for Betty’s paintings, I find that I have fresh eyes and a new perspective with which to evaluate the paintings I had carried as far as possible at the time. It is a wonderful feeling to look at a painting that I thought was carried to resolution and to see that it can go much further. When that happens I know that I have learned a great deal since the time I called the painting complete. The painting of the brick wine cellar remains a favorite of mine. I painted this as part of the series using underpaintings with multiple glazes of color. The design is strong. I think Croney is right when he says that it doesn’t really matter what you paint as long as the design and value patterns are strong. The purpose of the series Between Here and There is twofold: to explore the technique of glazing and to create a series of paintings that clearly illustrate the five elements of painting as simplistically as possible. I chose subject matter that presents a common, everyday experience, that of seeing the road cut through the landscape while driving in a car. The subject of these paintings is secondary to the elements of the paintings. The exhibit, Unveiled – The Anatomy of a Painting, will present both representational and abstract paintings. 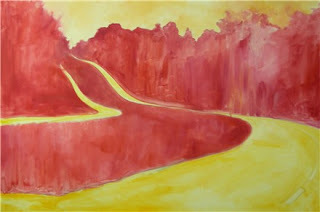 My hope is that the road series will introduce the idea that all paintings are working with the same elements. It is only through the artist’s skilled and successful manipulation of these elements that content and meaning are communicated to the viewer. My experience with this glazing technique has already inspired me to go further with it following the exhibit. In the future I will concentrate more on layered, composite drawings. In the road series, the drawing is extremely simple, stating only basic shapes and only suggestions of more complexity within those shapes. I begin with a photograph. Hah! I cringe at the thought of working from photographs. In this case, fortunately, I made an exception. Surface: My surfaces are either prepared birch plywood or stretched canvas. The plywood is sealed on both sides with two coats of acrylic GAC (made by Golden) and four coats of acrylic gesso. I sand the surface before applying the next layer. I also glue a frame made from 1″x2″ strips 2″ smaller than the board on the back to prevent warping and to provide a way to hang the paintings if they are not framed. Drawing: Working from the dimensions of the canvases and boards, I crop the photographs and rework them using pastels to achieve the shapes and values that will create strong compositions. Using a projector, I transfer the drawing onto the surface indicating only the basic shapes, avoiding any small details. Color Palette: My color palette is limited. I want to explore the range of color I can achieve using only White (Zinc White or Permalba White for transparent glazes and Titanium or Flake White for more opaque layering), Cadmium Yellow Pale, Cadmium Yellow Medium, Cadmium Red Light, Permanent Alizarin Crimson, Manganese Blue, Cobalt Blue and Ultramarine Blue. Mediums: I am using either oil paints or acrylic paints for the underpaintings. I am using only oil paints for the glazes. I am not using a medium with the oil paints for the glazes, only turpentine. Underpainting: For the underpainting I mix colors that are close to being the complement of the final color and are the same value as the final value. For example, if the sky will be a dark blue, I mix a dark orange. If the trees are going to be a mid-value cool green, I mix a mid-value cool red. I am experimenting with the warm and cool aspects of the underpainting and glazes. I will adjust my technique depending on the results. Glazes: Each layer must dry completely! I apply the glaze with a brush, sometimes rubbing it into the surface with a cloth or removing parts of it with a brush or cloth. Sometimes I scumble the paint over the surface. I keep the edges soft at this point. Sharp definitions of shapes will come in later layers. I mix colors both on the palette and on the painting, enjoying the nuances that are automatically created by the interaction of the underpainting and the glazes. I allow the underpainting to show through in order to preserve the push and pull that occurs when complementary colors are placed next to one another. The technique is quite simple. What is hardest for me is to be patient and allow the layers to dry completely before applying the next glaze. I am working on at least eight paintings at a time. That, too, is a new experience for me.